Here you are; my last batch of capsule reviews for films seen in 2013. My 2013 film lists will be posted within the next month. Usually I do a slew of posts including favorite and worst posters, song usages, worst films, performances, a myriad of top fives, and finally top 30 films split into 2 posts. This year I’m going to whittle down the favorite posters, worst films, and song usage into the top fives post. I’ll also continue what I started last year with a Personal Sampling of takeaways from the year in film. Mob movies have to work a little extra to earn my commitment. I’m not adverse to them, and there’s actually quite a few I like or love. But it’s not a genre I automatically care about. New World, written and directed by I Saw the Devil scribe Park Hoon-Jung more than earns my commitment. It pulls you in from the word go. It’s more about the characters and how their long-standing relationships go hand-in-hand with the choices that are made than strictly adhering to mob tropes. There is an unforeseen ripple effect that the characters can’t quite define, but they all know it’s there. The parking garage fight scene is a kinetic stunner, right up there with the final minutes of Drug War and The Grandmaster fight sequences for year-best. I seriously cannot stress that enough. 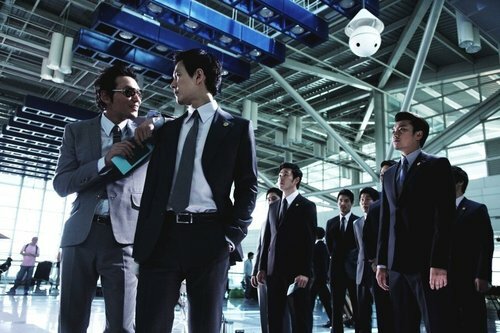 All of the performances are incredibly strong, none more so than Hwang Jung-min, his doofy swagger acting as a posturing veneer. This is swift, smart, and impressive all-around. It felt like a kind of unspoken love story between two ‘brothers’; the curious coda falls in line with this reading. Serviceable documentary that barely has to work to earn empathy, which ends up being an eventual disservice to the film’s quality. It does what it needs to do, it gets this story told. But there is an art to documentary filmmaking; they are not simply an information delivery service. And there are many conventional documentaries that succeed with flying colors. But Blackfish is very narrow, very blunt and lacking in nuance. Yes, it is gut-wrenching and very emotional stuff. Yes, it is effective. Yes, it is important for people to see. But delivering that information efficiently is not all it takes to make a great documentary; just a decent one. For instance, showing the Sea World ads is an easy potshot. Sure, show them once. But several times? Enough now; that’s lazy. What I did find the most interesting, this being an example of the film going beyond info-delivery service, had to do with the former trainers who were caught between being kept out of the loop (but sensing or knowing something was amiss), but staying on out of loyalty to the animals and the apparent relationship between them; a relationship that we come to see is part genuine and part one-way street. That is an aspect that comes through as we see the interviews, and it’s a collective experience happening below the surface of the text. It’s called layering. I’m also intrigued by the way it uses the orcas’ intelligence as a way to gather further empathy, but not addressing the idea that all animals, mostly of lesser intelligence, kept in zoos and the like is kind of on a similar scale? It’s not a knock on the film, and yes I’m talking about going from the specific to the very broad. But as I watched it, many of the basic actions taken against these animals in their separation and captivity can all apply to any zoo or park. In one way it feels like a way to pat ourselves on the back for caring without us having to address the larger scale ethical issues at hand. It’s a rough sketch of a thought I had. Blackfish does a nice job summing up its subject matter, but I’d have liked if it relied less on how easy it is to get its audience to be horrified by what we see as a substitute for craft. In theory I love the epic race films of the mid-1960’s. It’s a Mad Mad Mad Mad World is a favorite of mine; a farce to end all farce. But that is the only one I like! The Great Race has its moments but is too high-pitched as a whole and this one goes absolutely nowhere. It is steeped in slapstick with machine-driven repetition and it doesn’t know how to create and/or build comic situations. It’s stuck in first gear from all angles and is too attached to the aviation accuracy (which, yes, is pretty cool and Annakin’s knowledge is palpable and evident) to craft a story around the machines. All Western nationalities are brought down to the same level of buffoonery. Well, sort of. The reveal of the Japanese pilot speaking in a perfect British accent is legitimately hilarious. Most other crass jokes fall flat. The American cowboy protagonist is a total buzzkill. But as for the good things, there’s the whimsically animated title sequence, a spunky Sarah Miles, a young (and thus very much a looker) James Fox and…yeah that’s about it. 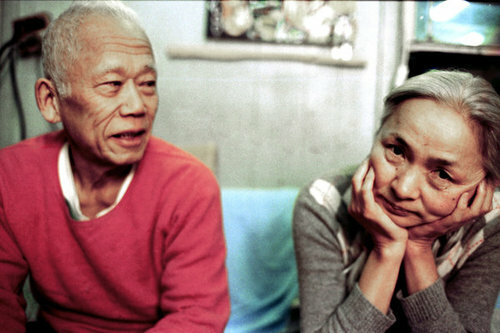 An engaging portrait of two NY-based Japanese artists and how art and marriage intertwine and repel. I found myself very attached to Noriko, whose marriage to Ushio feels like a sad and settled kind of familiar loyalty. She’s been through so much with this man and struggles for the kind of respect she deserves as both a woman and an artist. The feeling it has of biding its time both helps and hurts the film. I could have done without characters stating that Hannah Arendt has no feeling about a dozen times. 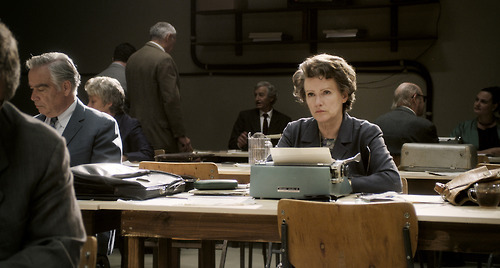 Hannah Arendt is consistent in its moderate interest, but it isn’t until the response to the New Yorker article finally kicks in that the film really takes off in ways philosophically transfixing. Sukowa is stern, likable, and has more conviction than the rest of us as Arendt. I particularly responded to the refreshing depiction of a healthy relationship in her marriage to Herr Blücher, and an equally healthy friendship between women with Arendt and Janet McTeer (who is awesome here) as author Mary McCarthy. 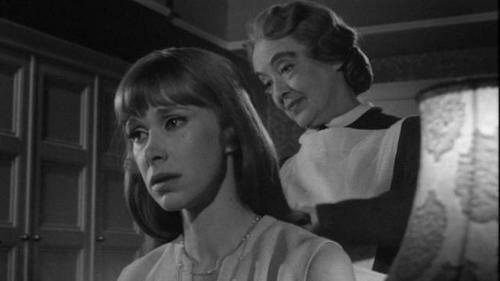 Surprisingly astute ‘psycho-biddy’ film dominated by excellent camerawork by Harry Waxman and future Kubrick camera operator Kelvin Pike. It’s slightly less straightforward than I expected, which I liked, and it maintains an inescapable atmosphere throughout. Presents moral dilemmas without really taking them anywhere. Feels like a season of procedural crime drama crammed into 2+ hours. On a basic level, it’s thoroughly watchable, but only intermittently engaging. Anything and everything going on with all four parents was more than a little rote, and while Hugh Jackman really gives his all, it’s a burly performance that lacks form. Jake Gyllenhaal on the other hand is compelling and magnetic in a way I’ve never quite felt from him. We know next to nothing to nothing about Loki (except tattoos and twitching!) but every moment with him feels informed in a fully-realized way. He’s tired and going through the motions but he’s still all in. The way he handles the scenes with Jackman, trying to calm him down, is mechanical, and says a lot about him without really saying anything. Melissa Leo reminds me of a Hollywood-version of a patron from my library. Which is freaky. Roger Deakins partially saves the day, making Pennsylvania a foreboding and chillingly stark place where hope seems to have evaporated and everything cuts just a little but more. A late sequence that functions as one of the film’s climaxes, features cinematography as the star. A blue-streaked and bloody race to the hospital becomes a year highlight. The definition of an undiscovered jewel. Patricia Gozzi, looking like a gamine teenage Juliette Binoche, is uncut, honest, and raw as the troubled Agnes. Everything feels like a highly fractured fairy tale; delusional, grand, and run-down. It’s keyed into French New Wave sensibilities but isn’t led by them. The isolation and family dynamics sit somewhere above us, slightly inexplicable and unconventional but visible all the same. Dean Stockwell is sort of impossibly good-looking in the 60’s, something I wasn’t aware of until now. Seek this out when you can. It’s sumptuous, troubling, and off-kilter in equal measure. 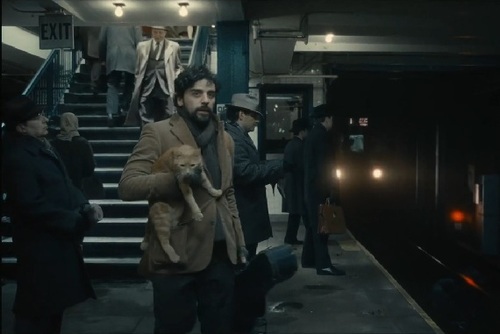 Inside Llewyn Davis uses the Greenwich Village scene to evoke the warmth of community, and creative outlets amidst the chilly haze of winter (courtesy of Bruno Delbonnel), and one man’s anonymous search outside that epicenter for success, purpose, and place. When trying to describe how I felt after this film ended, I mistakenly landed upon the film having the kind of heart I don’t often find with the Coen Brothers. But this wasn’t the sentiment I was looking for. They often have heart; but there’s a softness, an emotional center to this film that I haven’t quite experienced from them, at least based on my emotional response by the time the credits rolled. It attaches itself to cyclical journeys within journeys, streaked with surreal touches and a cat (well, more than one cat) that overtly represents the idea of journey (the cat’s name is Ulysses!) It’s about how we are and who we are within the universe, but also about the search for something that might not be there; in this way it reminded me of an acute depression. We drift along with Llewyn, as he comes to life through song and only through song, a dreary wanderer whose supposed lack of routine reveals itself to be just that. Attempts to break the cycle lead him to the start. It’s clear the guy has lots of talent but he seems destined for the eternal winds. The film has a spiritual and structural connection to both Barton Fink and O Brother Where Art Thou? Oscar Isaac is a revelation. There are a lot of showier performances this year (not a knock), but Isaac might be the one that ends up sticking with me most. He’s resigned and has a chronic tendency to burn his bridges. But he’s got this stuff in his blood, and Isaac is this guy here, always suggesting a fullness of character that doesn’t come around too often. If I have one complaint, it’s that Carey Mulligan’s Jean stands out as even more shrill and cartoonish than most Coen Brothers supporting characters. It’s written and played to the hilt in a way I didn’t find satisfying or successful. I liked this quite a bit overall. McKay and team have a throw-everything-at-the-audience and see what sticks kind of mantra, which lends a hit-and-miss quality to their work. This is evident in most broad comedy I like (I’m also very picky with my broad comedy and Anchorman happens to be an instance when it works for me big time). I’m not sure the sequel ever feels like a full film as it’s more concentrated on the parts, but a lot of those parts are hilarious so it’s hard to complain. It’s also worth noting that this is the kind of film that works least on a first viewing. It’s built for re-watches, the kind where you latch onto your favorite things and sort of ignore the duds. But basically I just love seeing these guys work as these characters. 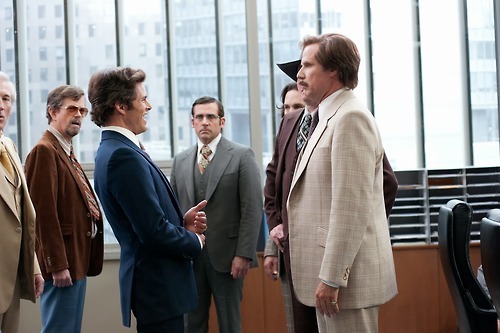 Ron Burgundy feels like the role of Will Ferrell’s career; he slips into it so naturally. They all have an innate sense of timing and rapport with each other that just becomes a pleasure to watch. Carell’s role as Brick is obviously much expanded. It can become a bit much but many of its finest moments come from him. A scene where Brick shows up to his own funeral and the guys have to convince him he’s still alive might have been my favorite part. I wish a lot more had been done with the satirical elements it introduces involving the advent of the 24-hour news network. Idea kernels are there but undeveloped. And all of the racial humor fell flat for me; I’m not really sure what they were trying to do with this but it was one-note and mostly uncomfortable as opposed to funny uncomfortable. I’m also disappointed that Christina Applegate is given next-to-nothing to do. But for every failed subplot or flatlining punchline, there’s a scene that starts with Brick, Brian, and Champ laughing their asses off at Garfield comics or a delightfully random section involving sharks and a lighthouse. Such is the way of comedy, and for all its weaknesses, these happen to be man-child characters I enjoy watching, and so the performances ultimately hold this thing together. Alain Resnais’ late-career film proves he is still challenging and pushing the medium of cinema up until the last. That’s a vibrancy and inventiveness I on’t take for granted. However, You Ain’t Seen Nothin’ Yet feels limp. It calls back and forth to itself, hides and peeks out from within, but in effort of what I’m not sure and ultimately can’t seem to care. The parallel stories that come to life by a group of actors playing themselves is never involving, and the tricks on display only furthered my awareness of this. Nice round-up yo. I remember hearing about Blackfish, sounded like an interesting documentary to check out, I don’t there was much of a release for it over here in the UK though. Glad to hear such good things about The Wolf of Wall Street and Inside Llewyn Davis, those are two films I’m really looking forward to seeing in the cinema.